KUBINKA /Moscow Region/, August 22. /TASS/. 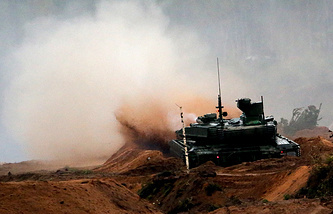 Russia’s upgraded T-90M main battle tank considerably surpassed its T-90A predecessor by its combat efficiency at the Zapad-2017 strategic drills, the press office of Uralvagonzavod defense contractor told TASS at the Army-2018 forum on Wednesday. "By its combat efficiency, the T-90M tank considerably excels its predecessor, the T-90A. The participation of T-90M tanks in the Zapad-2017 drills fully confirmed the armored vehicle’s performance characteristics required by the Defense Ministry of Russia," the press office said, replying to the corresponding question. A contract on the delivery of the T-90M heavily modernized tank to the troops was signed between the Defense Ministry and Uralvagonzavod at the Army-2017 international military and technical forum. The T-90M tank was furnished with the new engine and equipment and with the latest version of the Relikt explosive reactive armor. As was reported earlier, this year, the Russian troops are expected to receive a battalion set of T-90M tanks.